The MoveStrong FitGround has been a hit on campus for Ole Miss University! Start the school year off with outdoor workouts led by the University Recreation staff and trainers. Or take part in your own individual workouts as a break from studies. No better way to get fit and stay healthy while taking in the fresh air and sunshine! "As we start our fall semester off, we are always looking for great ways to increase our patrons experiences in our facility and when using our fitness spaces. Adding our outdoor boot camp at the Fit Rig (FitGround) has been a nice addition to broaden our impact on reaching not only students, but faculty and staff, and community members as well. Our twice a week, free, boot camp class is geared for those of all fitness levels and is taught by a certified personal trainer or group fitness instructor. Our goal is to increase the Lafayette, Oxford, University (LOU) community’s knowledge of staying active and healthy, while increasing the use on our new MoveStrong FitGround outdoor fitness stations." 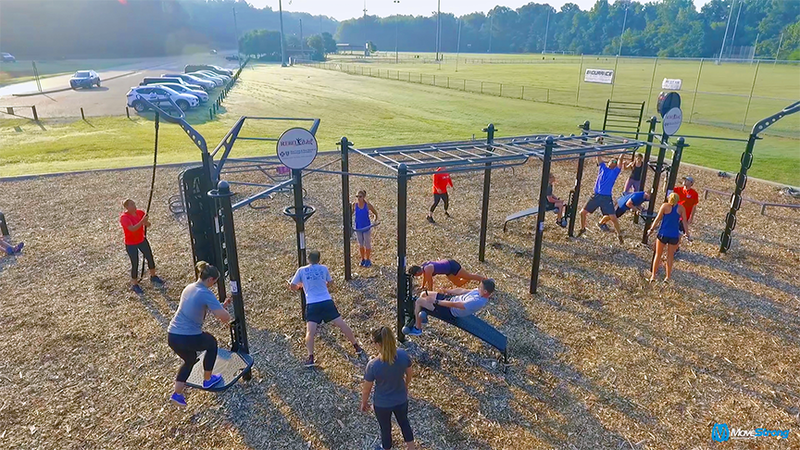 The MoveStrong FitGround is a collection of outdoor fitness equipment designed for year around use and can be configured to fit any size space and training needs from functional fitness, obstacle course, ninja warrior training, and calisthenics.